I went and looked at these two units today,, wanted to see the difference in the 51/52 from a 2350 which I own. first the 2551 2009 asking 54,900. Next went over to PPL in Houston, consignment dealer, great place to look at all types of units, I like to go over there and just look, see all kinds of models and types. Very nice unit,, again did not drive, no dealer,, you just go look. has the slide with couch/bed, all chairs are leather, has the new types of windows, black solar screen, then the brown shade, levelers, linoleum(?) floor, maple cabinets, inverter I think has the sani-con system, paint.decals excellent,, of course only year old. the 52 had the chair, while the 51 has a flip up tray for the pass seat, I guess that is the difference, I know when you look at the PC site they have some other options, I can see why people like the two beds very nice,,, I fell in love with the windows on the 2012 52, outside they look like they are just big flat pieces of glass and the like I said the shades are very nice. I also noted both units have upgraded or have a new type micro/conv oven very nice. Well I killed two birds got to see the units, now I need to see a 2100, 2400 haha.. This is sold but interesting video that shows a 2552 with captains chair in place of the euro chair, allows a 3rd passenger to ride in style. Earl says can do on new order no charge. Tks randall,, you can read, look at pictures/video's all you want, but until you actually walk in and feel the unit do you really get a feeling for it. by first impression was of course the length and bigger(more roomier) than the 2350,,,,, I would assume that the 2350, 2551 and 2552 are the units sold most by PC... the main reason I went out to look at them was to see the difference since we talk about these units all the time. And like I said earlier now I need to see the 24 and 21. Our 2007 PC 2350 came with a barrel chair. A few years later I replaced it with a 3rd captain seat. I got the idea from a forum member. Was that Bob M?. It reuses the pedistal, a project that took but a few minutes to swap seats. We love it. Like you say, a 3rd passenger can ride in comfort. When I want to relax or watch TV, I favor quickly adjusting the seat close to the dinette and use the dinette seat there as my ottoman, over the later picture just for quick convenience. 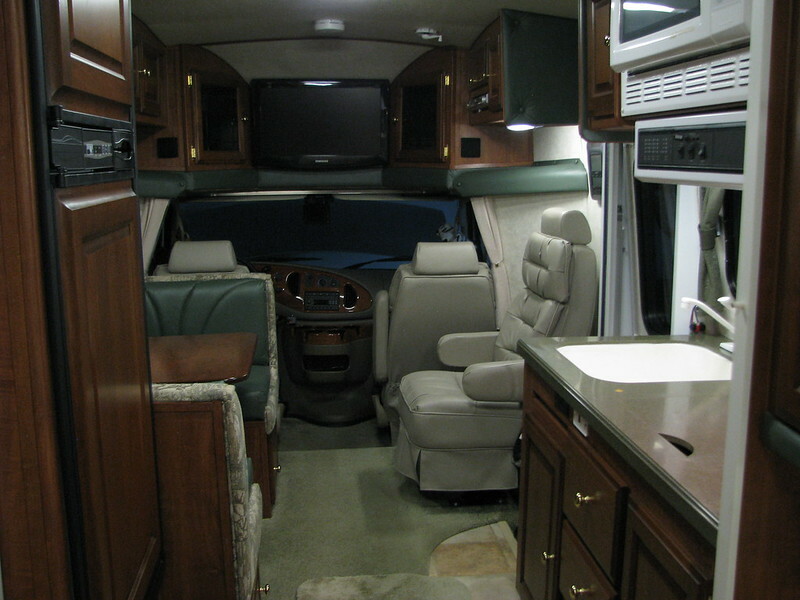 We use the large area under the captain seat for all our shoes and more....great storage under it because of that pedistal....lot's of usable floor space for stuff that naturally gets hidden by the seat skirt. ADDING: This picture shows the chair Fully adjusted against the wall which is still comfortable sitting upright. 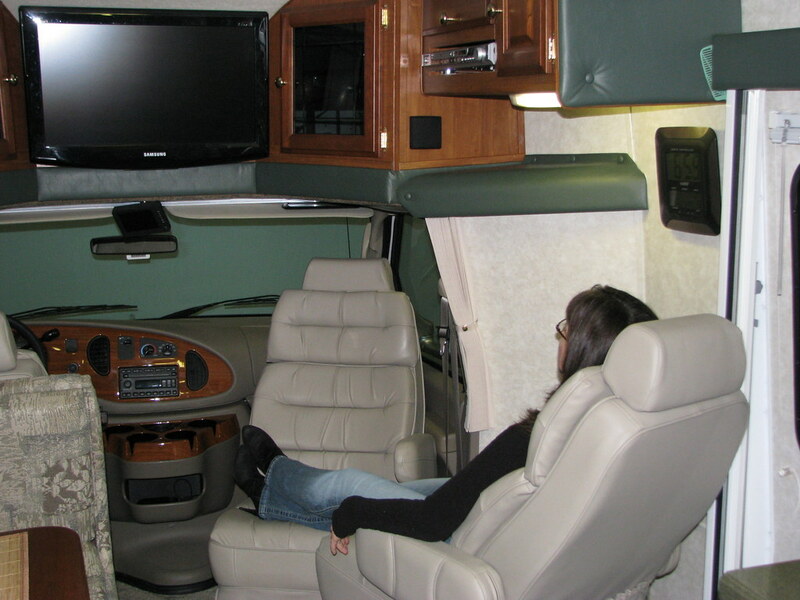 To recline we adjust forward away from the wall toward the dinette which allows the backrest to recline nicely. Thanks Ron, was wondering if 2350 had space to accommodate captain's chair, yours looks great. After Ron changed his chair, I did the same thing in my 2350. I now have the euro chair in my 2552. I feel the euro is a little more confortable but the pedistal was easier to move away from the wall. No worrying about clamping it down before and after driving. Hi David -- I know it's been awhile, but do you happen to remember what the "couple of things needed to be fixed" on this unit were? Interesting that this 2551 appears not to have sold yet they have raised the asking price since you went to see it months ago!